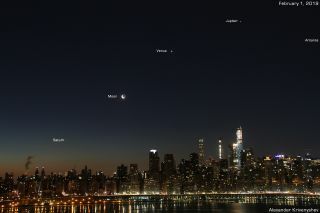 Alexander Krivenyshev of WorldTimeZone.com captured this alignment of Saturn, the crescent moon, Venus, Jupiter and the red supergiant star Antares over Manhattan during the predawn hours of Feb. 1, 2019. Celestial sights rival Manhattan's lights in a gorgeous new skywatcher photo. Alexander Krivenyshev of WorldTimeZone.com captured a glorious arcing alignment of Saturn, the crescent moon, Venus, Jupiter and the red star Antares over the Big Apple shortly before sunrise on Friday morning (Feb. 1). "It was a great show — no time to sleep!" Krivenyshev, who took the photo from Guttenberg, New Jersey, told Space.com via email. This skywatching spectacle was pretty special, but don't fret if you missed it — the principal players will continue putting on various shows for a while. For example, in the predawn hours of Feb. 18, Venus and Saturn will hang very close together near the horizon, separated by a mere finger's width from our perspective here on Earth. And a quick word about Antares, one of the brightest stars in the sky: It's a bloated red supergiant about 700 times wider than the sun but less than one-millionth as dense. Antares, which lies about 600 light-years from Earth in the constellation Scorpius (the Scorpion), is nearing the end of its life and will die in a violent, dramatic supernova explosion before too much longer (in the cosmic scheme of things).